As a boy of five years old, I attended Kindergarten at Mrs. Knight’s Kiddie College. Our classes took place in the First Baptist Church. We would have our recess behind the church where some swing sets and see saws were located. But sometimes, we would go and play in a grassy area beside the church. This area was bordered by two rows of hedges which converged into a point, thus we called it, The “V”. Kindergarten would not be my last time in The “V”. A few years later, I would join the Royal Ambassador’s. The Royal Ambassador’s is a Bible-centered, church-based organization for boy’s in grades 1-6. We would load up in my mother’s Oldsmobile Vista Cruiser station wagon and she would drop us off between The “V” and the church. Our group would meet every week and we would stimulate our minds and spirits with teachings from the Bible. After our classroom instruction, we would exercise our bodies in The “V”. We would usually have a game of football or dodgeball. My mother would wash many a pair of blue jeans with grass stains picked up at The “V”. Boys grow up. They get their first cars and forget about some of the things they did just a few years earlier. My ’67 Mustang would pass by The “V” hundreds of times as I drove on the “main drag” in my hometown. Sometimes I would glance over and give it a cursory look, remembering throwing a football within its confines, but most times, I never gave it a thought. The First Baptist Church would move to a new building on a new property. The old church would still serve as a house of worship for another denomination in town. All the while, The “V” continued to stand vigil over 3rd street. I would go on to college, then military service and then make a home in another city. Over the course of thirty years, I would come home to visit my parents and each time would find me driving down 3rd street and passing by The “V” once again. One evening, I was on the phone with my mother and she said that the city and county were going to erect a Veteran’s Memorial on a spot next to the old First Baptist Church. Upon hearing that, I knew exactly where it would be located. It had to be, The “V”. No more fitting place would be suited to stand as a memorial. The symbolism of The “V” is fitting for honoring the Veteran, but it also stands for Victory. Long before the iconic two finger “peace sign” of the late sixties, Winston Churchill first used the gesture as a symbol for Victory. To me, Churchill’s symbol holds more meaning, for without Victory, there is no peace. During one of our evening chats, my mother mentioned that she would be sending me some forms to fill out for the Veterans memorial. The memorial committees plan was to have individual engravings of each veteran’s service information as part of the monument. She also asked me to fill in the service information for two of my deceased brothers and my father. My surviving brothers filled out their individual information and my oldest brother filled out one for his father. Time passed and I received another call from my mother. She said, “They are going to dedicate the memorial on the Saturday after Veterans Day. I sure would like for you to come over so we can go together.” I said, “Of course” and confirmed the time I would pick her up. It was a cold, crisp November morning and the sun shined brightly. I walked into my mother’s house and she was standing in the kitchen with an eager look in her eyes. She smiled and said, “Are you ready to go?” I answered back, “I sure am” and I gave her a hug. She was beautiful. You would not think that she was 89 years old. Her hair and make-up were perfect and she was wearing a stunning overcoat in her favorite color, red. She was also prepared. She had a thermos of coffee and the ever-present snacks in her purse. We drove to town and found a parking place next to the church across the street. As we made our way up to the memorial, my mother greeted many friends with a beaming smile on her face. There was already a large crowd assembled as we made our way to some chairs that stood next to the memorial. We sat down and waited on the ceremony to begin. As the first person began to speak, my mother reached for my hand and smiled. This memorial meant a great deal to my mother. She, and many more citizens of Butts County, had earned it. The architecture of the monument is beautiful and brilliant. At the point of The “V” stands our Nation’s flag and the flags of the different branches of the Armed Forces. Extending out on either side are angled walls which contain engraved stone square blocks. 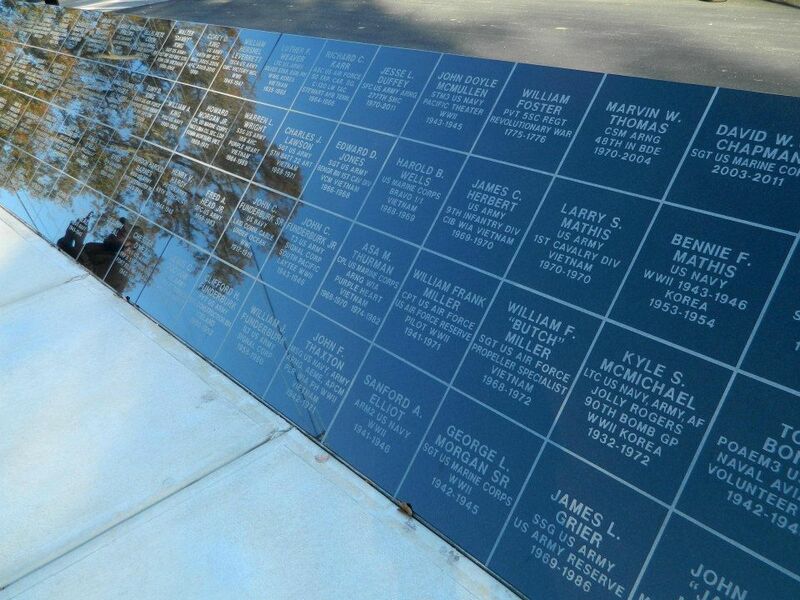 Each square is engraved with the name and service information of the veteran. At the top of The “V” stands the main feature of the memorial. It is an impressive black granite wall. 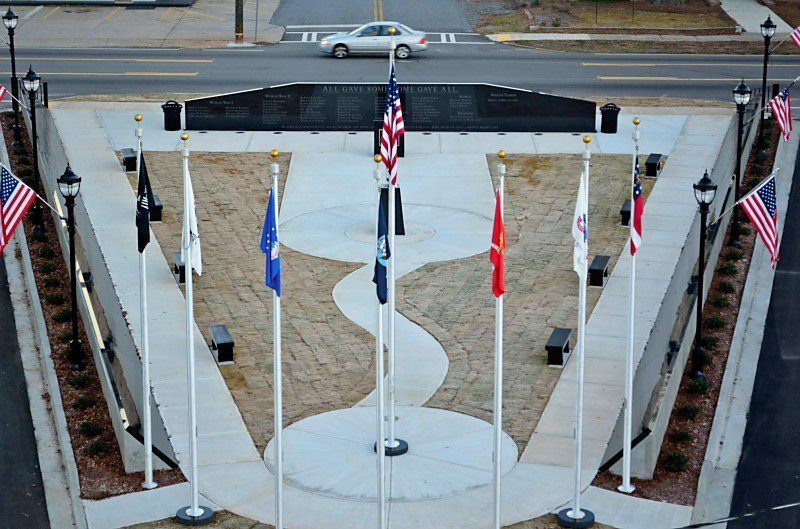 On the front of the wall facing the street is the engraving, “Jackson Veterans Memorial Park”. The reverse side of the wall facing into The “V” is engraved at the top with, “All Gave Some, Some Gave All”. Below this inscription are the names of all the service men and women who made the ultimate sacrifice. Listed by war, the names detail the human cost of liberty that was paid by the citizens of a small rural county in middle Georgia. There were eight soldiers lost in World War I. One of those soldiers was my mother’s Uncle Jesse. She would never know him. Jesse was a soldier in Company G, 148th Infantry. He succumbed to the effects of gas in the trenches on the French frontier. He died on October 22, 1918. He was 25 years old. There were over 40 service members lost in World War II. Two of those lost were first cousins of my mother. 2nd Lieutenant Robert C. Reynolds, U.S. Army Air Corps was killed when his bomber was shot down over Austria on May 10th, 1944. He was the only Air Corps serviceman killed in action from Butts County. He was 22 years old. Seaman 2nd Class Charles E. Carr, U.S. Coast Guard, was lost at sea in the Pacific Ocean on January 29th, 1945. His obituary stated that he was a popular young man and was a talented singer. He was 19 years old. There were 3 service members lost in Korea. One of those was my mother’s first husband. 1st Lieutenant Carl L. Kelly, U.S. Army, was killed in Korea on February 12th, 1951 while leading an assault against the enemy. He was posthumously awarded the Silver Star for gallantry. He was 32 years old. While sitting at the dedication ceremony, I gazed at the names on the monument wall. I then focused on the names from World War II. Over 40 families suffered the loss of a loved one. The population of the county was less than 10,000. Sacrifice was felt by all. The price of freedom and liberty does not come cheap. 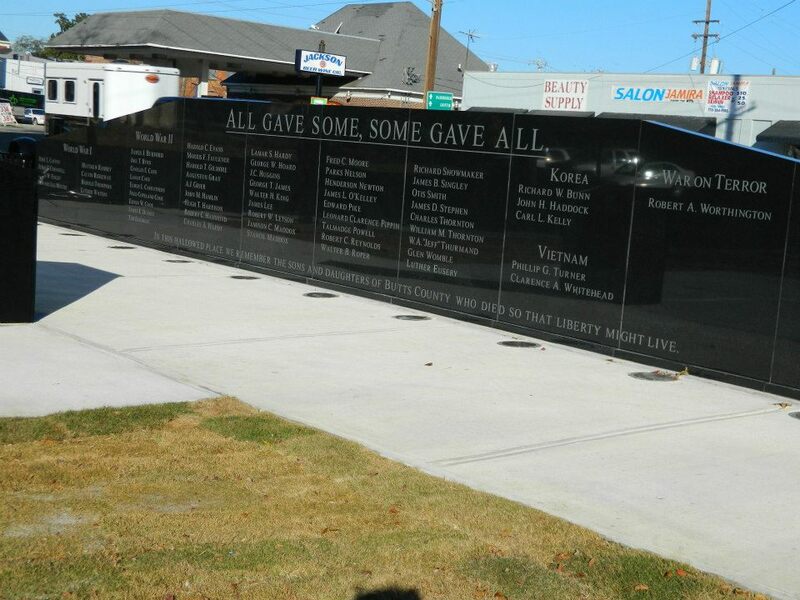 Inscribed at the bottom of the memorial wall are the words, “In this hallowed place, we remember the sons and daughters of Butts County who died so that liberty might live.” These words were penned by my cousin, J.M. Brewer. The year of the dedication, he also wrote a poignant piece titled, “In This Hallowed Place” on his blog at http://www.theliteratepen.com. After the dedication ceremony concluded, my mother and I mingled in the crowd, speaking with family and friends. One of the encounters in the crowd was significant to the moment. My mother and I encountered “Buck” Thompson and his family. “Buck” was a World War II veteran who had served with my mother’s first husband Carl. They were both members of the “Jackson Rifles”. My father had also known “Buck” for many years. The smiles and greetings they exchanged were a metaphor for the significance of the day. They were both happy to see this standing tribute. Another good article, Chip. Thanks for doing these. Love this article, also the one you did on your mother several years ago.